Under 20% of plays produced on American stages are written or directed by women, and of those most are at the smaller theatres where remuneration is minimal. WORKS BY WOMEN is dedicated to redressing the situation by encouraging theatre-goers to choose to see plays by women, supporting their work and showing producers equity matters to their audiences. This blog was founded in 2010 to bring these issues to the fore and recognize the talented female artists working in theater today. Thanks Stéphanie. What great news. We would love to hear more about this. 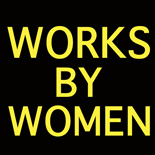 E-mail us at worksbywomennyc@gmail.com. Thanks, Works by Women! I just found this blog and I am delighted that women in theatre are banding together! I’m excited. I hope to see you ladies soon! Thanks Laurel. So excited you’ve found it too!